We’ve said it before and we’ll say it again – finding your voice matters. How you communicate your brand to clients, customers, investors and the public all stems from the tone that you give off in all your touchpoints. Copywriting is not only a window into the way your brand works for consumers, it’s a chance for you to put your best foot forward. It’s an opportunity to relate to your target audience in a way that other aspects of the marketing strategy don’t allow for. One of the most exciting things about copywriting is that it can turn even the most everyday products or services into catalysts for great storytelling. Selling cars? You’re really selling the idea of luxury, exclusivity and status. Your copy doesn’t have to drone on about miles per gallon or horsepower, which could be important, but Instead, focus on the narrative of the buyer. How long did he or she research this car, why is it important to them, and what made this specific car the one they picked? Selling a Mercedes? The same principle applies. You’re selling nostalgia, and the child-like feeling of joy that most people still get when they unwrap a candy bar. Take Krispy Kreme for an example. 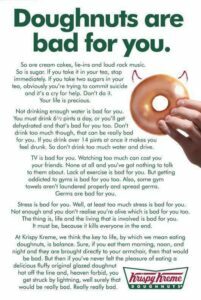 In an attempt to sell doughnuts, they go into great detail on why doughnuts are bad for you. Of course, they also point out that loud music is bad for you too, as is sugar, and really, anything that makes life worth living. The beauty of this copy is that it’s not lying to you. In fact, it’s telling you something you might not want to hear. But, really, they’re telling you to treat yourself. Who doesn’t deserve a doughnut every once in a while? In the mind of the reader, Krispy Kreme is no longer a faceless corporation. Instead, they’re a friendly voice in your head telling you that – hey, it’s okay if you want to reach for that second doughnut.